We wrote a short piece about recent research on the products of the 2014-2015 Holuhraun eruption on Iceland, which was published on Uppsala University’s website. Here is a modified version below – happy reading! Holuhraun – the volcanic eruption that captured the imagination of a nation. Immortalised in Icelandic stamps and a huge tourist attraction, the 2014 Holuhraun eruption also received the attention of the world’s volcanology community. Indeed, the Holuhraun eruption can easily be regarded as one of the best ever monitored eruptions. Geophysicists tracked the movement of magma beneath the ground surface in outstanding detail in the run-up to eruption. Now, on the second birthday of the Holuhraun eruption, a team of scientists from Uppsala University, Sweden and the University of Cape Town, South Africa, deliver new information about the generation of the Holuhraun magma from the crystals it contained, which record the magma’s journey like little flight recorders due to their progressive growth during magma storage, ascent, and eruption. 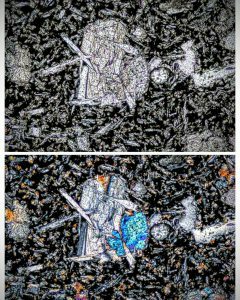 “By studying their chemistry, we can decipher at what depth the crystals were formed and where they stalled on their way to the surface. With this information we can reconstruct how the magma travelled upward and laterally in the weeks prior to the eruption”. 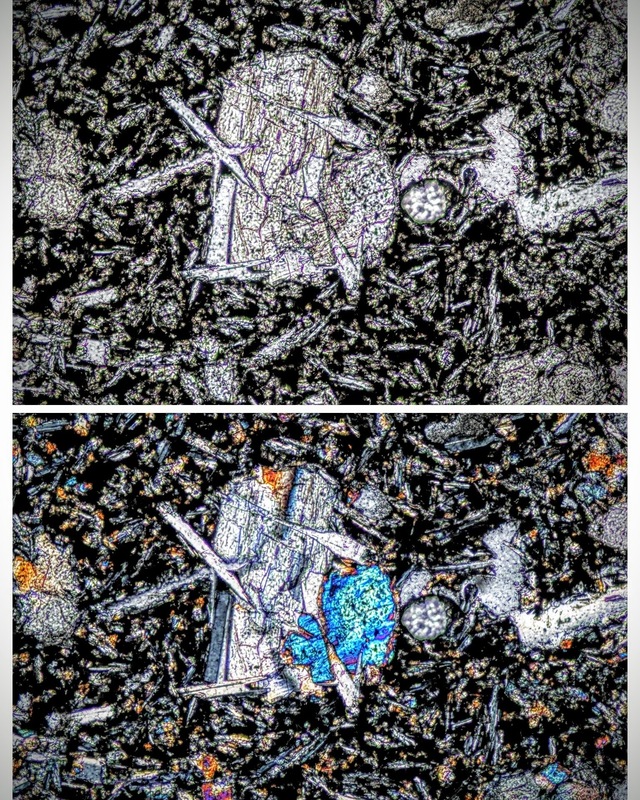 Crystals in lava from Holuhraun viewed under a light polarising microscope. Harri goes on to explain that crystals were born and stored at multiple levels in the crust, over a depth range of 28 to 5 km beneath the nearby Bárðarbunga volcano before the magma was siphoned off and transported laterally, through the Earth’s upper crust, to the Holuhraun eruption site. 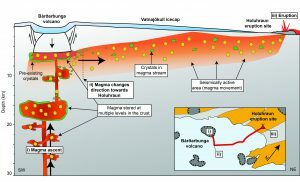 The Uppsala group even found evidence that part of the magma was recycled from older crystalline material, likely from beneath the Bárðarbunga central volcano some 45 km to the SW of the eruption site. In fact, Bárðarbunga’s central crater deepened before the eruption at Holuhraun, implying that magma beneath Bárðarbunga volcano was transported away and added to the rising stream of molten rock towards Holuhraun. The research results by the Uppsala group are consistent with the extensive geophysical data, but they lend a new dimension to our understanding of sub-surface processes occurring before the eruption at Holuhraun. The study by Geiger and co-workers shows that magma can be tapped from multiple storage regions beneath the surface and merged into a final erupted product, thus providing an exciting new addition to our knowledge of volcanic processes on Iceland. “This is something we need to keep in mind for future Icelandic eruptions, especially where large central volcanoes like Bárðarbunga are located close to where the crust is rifting, as was the case at Holuhraun”, says Harri Geiger. 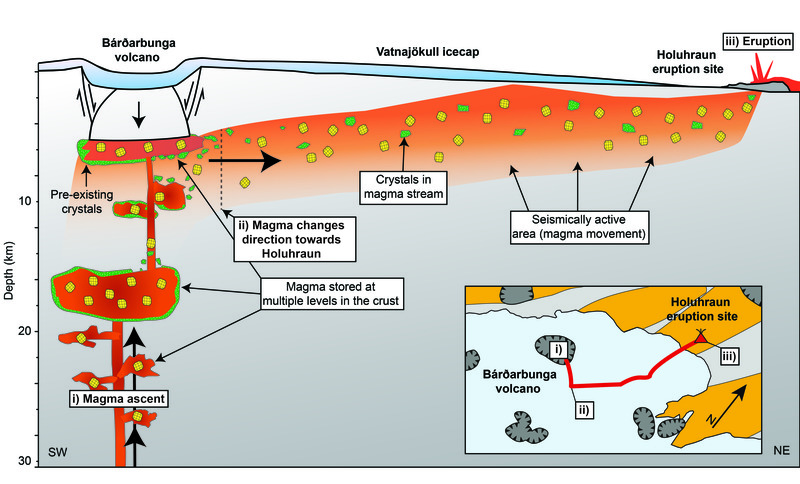 Cartoon showing the magma supply system beneath Bardarbunga and Holuhraun. Modified after Geiger et al. 2016. The research was supported by the Swedish Research Council (VR) and the Center for Natural Disaster Sciences (CNDS) at Uppsala University.